Our Calcium Caseinate is derived from fresh New Zealand skim milk from pasture fed cows. It's extracted from casein through acidification. 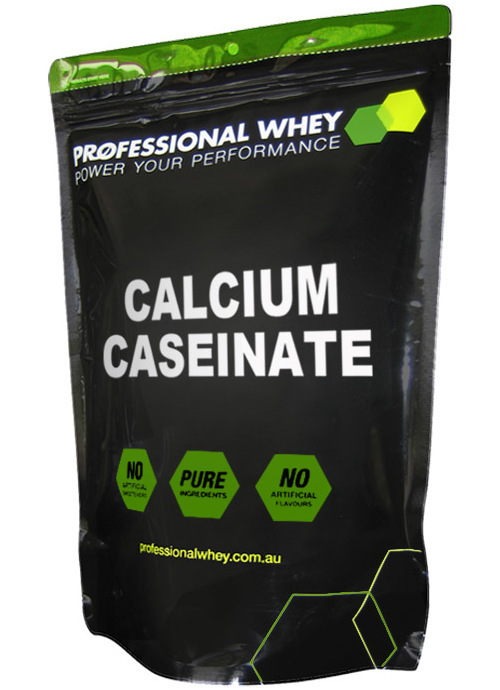 Calcium Caseinate is a very slow digesting protein that is very high in L-Glutamine and therefore has been shown to have potent anti-catabolic properties. 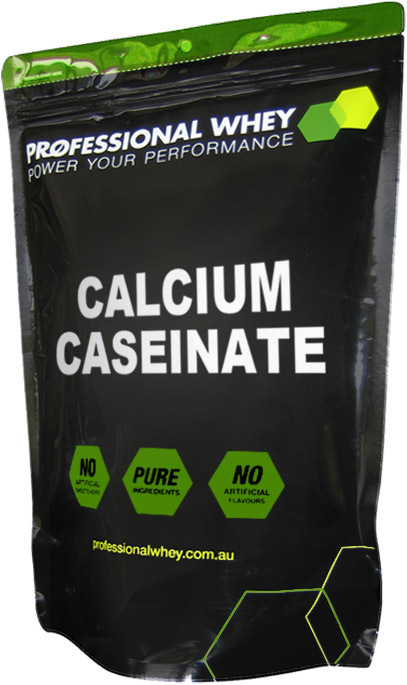 Calcium caseinate is one of our core types of casein protein that is designed to thicken shakes. It starts at $35 for 1kg with bulk discounts offered on multiples of our 1kg packs where you can save big. Note: Calcium Caseinate is a lot thicker and a little harder to dissolve than our Micellar Casein MPI. It also has a chalkier mouth feel. Therefore you may need to use a blender to dissolve Calcium Caseinate. Mix 27g (one level scoop) of Calcium Caseinate into 250ml of milk or water until dissolved in a shaker. Use less liquid for a stronger taste and thicker consistency. Calcium caseinate while more expensive than some other protein sources is a highly pure, complex long lasting source of protein for the body. Through Professionalwhey it is quite reasonably priced. I really like this stuff. I use a 50/50 mix of calcium caseinate and whey. The CC digests slower keeping me feeling full for longer. I use two measures with my breakfast making the milk taste far creamier. I have found it dissolves better in milk than water and while it does still froth it's evenly throughout the mix and letting it sit in the fridge for half an hour takes care of that. I prepare a double scoom serving with a teaspoon of quick for an after workout smoothie. Calcium Casinate has been an important part of my daily training regime for the last few years now. It has been the icing on the cake for a great day of clean eating and hard weight training. I drink it as a shake last thing before bed time and feel confident that I am supporting muscle growth with a premium quality protein absorbed slowly by my body as I sleep throughout the night. It can be a little harder to mix and is thicker than my wpc but I just shake it in a shaker with milk and it mixes fine. I actually now enjoy its thicker nature as it feels more like a meal in a shake! This powder is the perfect meal replacement protein. It burns slow and the taste is neutral so it goes with any flavour, I've tried everything from baked pumpkin with a touch of maple syrup to Coke Zero and a quarter vanilla bean and this powder tasted great with all of them. A word of warning though, it does need a blender and lots of liquid to have the proper consistence. It will NOT mix in a sports bottle. You have been warned. It tastes fine but is hard to mix in a shaker, most of the time is very lumpy. Works well in a blender. Calcium Caseinate is great, I play a lot of basketball, and at the same time im trying to tone up and add gain some muscle, I use WPI throughout the day which is fantastic and I use this before I go to bed. It tastes fine, the only negative is its just so hard to mix, using warm water and a blender helps, but I still get these horrid chuncks which are hard to swallow at time. Other than that it's a great product and truly helps. I love this stuff , makes great shakes , has a neutral taste when mixed with plain water . Preserved my muscle when doing heaps of cardio !!! I actually prefer this over the micellar casein as it really has no taste of its own. I usually mix it with straight with just milk and ice cubes and it comes out great like a very slightly 'jellified' chilled bottle of milk which is perfect before sleep. I would recommend trying both this and the Micellar to see which you prefer. My Review on this one..
Good nutritional profile but hard to mix and turns to a very thick and chunky glug if you use even slightly too much powder compared to the amount of water you have, also seems worse the colder the water is and you have to drink immediately to avoid this. I wouldn’t recommend this powder because of the mixing issues…go the micellar casein instead.